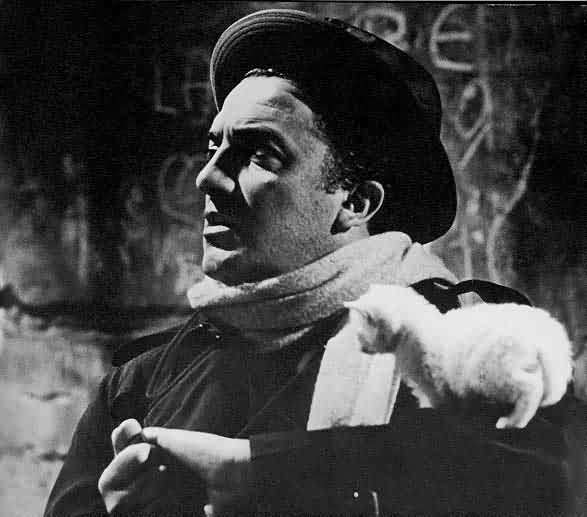 In Defense of Fellini. | poemless. a slap in the face of public taste. This was fascinating. It makes me want to see 8 1/2 – and I did not particularly care if I saw it after coming out of Nine. On the other hand, I don’t really have any thoughts on your views because I haven’t seen 8 1/2. Any film must stand on its own, it can’t depend on the audience having seen or read the original on which it is based. This film did not stand on its own. From what you say it did not stand on the shoulders of the original either. I actually forgot about Fergie – I did think she was particularly good. On the other hand – the reason I probably forgot about her was that the character seemed to come and go so fast. And while the encounter certainly would have left an indelible memory for him – SHE didn’t change in any way. Not the way that Claudia and Luisa changed and therefore forced him to change. I’m happy to find out that the original actress who played Luisa was French. Because I admit that at one point in the movie I thought to myself – they must think Americans are so stupid that you can put in actresses with French accents or Spanish accents or English accents and think they can fool us into thinking they are Italian. And Nicole Kidman (about whom I disagree, I thought she did a good job with what she had to work with although I can see why you think the role should have been written differently and filmed differently, but that wasn’t her fault) looked like Brigid Bardot, not an Italian actress. And Sophia Loren – really what was the point of even having her in it? Sure, she did a great job. But it was a nothing role. Which makes Fergie’s performance all the better because I really did think she captured it perfectly and while she was on the beach I felt like I was watching an Italian film. Would you have thought this if the entire cast were American? With American accents? I mean, a good actor should be able to play roles of characters who are not the same nationality as they are. Also, why the insistence on character development? Obviously this is important in some movies, but generally it’s not an essential aspect of film. Looking at this sentence I think I left something out. Did they think they could put in actresses with French accents or Spanish accents or English accents and think they can fool us into thinking they are Italian WHEN THEY AREN’T DOING ANYTHING TO ACT ITALIAN. That thought came out of my remembering Fergie’s performance. She seemed to capture the Italian woman as portrayed in films of that era very well. I can’t remember if she did an Italian accent or used her own accent. It didn’t matter. The other women didn’t. So their accents were noticeable to me and I wondered if he intentionally chose an international cast because it would help create his illusion that this was an Italian film (thus, thinking we were so stupid that any accent will do for us). Character development is important to me in films and if it isn’t there there’d better be some other part of the story that grabs me to make up for it. Interestingly it isn’t nearly as important to me in novels. I imagine it isn’t nearly as important in films to people who are more visual than I am and who appreciate film for the film aspects. I’m really not very visual at all – films are all about the story for me and the visual aspects have to serve the story or I get bored. Um, one minor quibble … Arthur Kopit’s “book” is the written text of the musical, not an actual Book. The book is the script sans music and lyrics. If this is a quibble with Wikipedia, I think you can actually fix it. If it is a quibble with me, I don’t really see what it has to do with anything I wrote. That sounds more snippy than I meant it to sound! I just mean I don’t think it would change my review of the film. What’s weird about the original NINE is that it’s not a remake of 8-1/2, it is in fact an adaptation of a Broadway musical based on the musical NINE (and Arthur Kopit, the author of the Broadway book, will be in Chicago in a few weeks, FWIW), so while I was hopeful because I loved CHICAGO and will pretty much watch anything Daniel Day Lewis does (I’m still in awe at what he did in THERE WILL BE BLOOD), I was always iffier about NINE than CHICAGO, which I thought was nailed pretty well and had the added advantage of nailing down some mid-00’s zeitgeist, like Fellini did with 8-1/2. Now, the NEW YORK TIMES last week argued that if you really want a filmic Fellini homage that does all of the above and puts an uniquely American spin on everything from blocked artists to autobiography to how life and creativity intersect to the curves of men and women, the movie you really want to see has already been made: Bob Fosse’s ALL THAT JAZZ. Perhaps Roy Schneider didn’t have that Marcello Mastoriani cool (he definitely didn’t have the wardrobe), but as a man who lived and breathed and died for his art (not to mention a willowy Jessica Lange), I think ol’ Fosse pulled off what Marshall tried and couldn’t quite do with. (And if you want cool in ALL THAT JAZZ, you’ve got Ben Vereen and that great climax to the tune of “Bye, Bye Love (Life)”). Pure American sizzle rather than Italian cool, but in my book they hold up as a credible and solid double feature. Scheider. Roy SCHIEDER. I’m so ashamed.